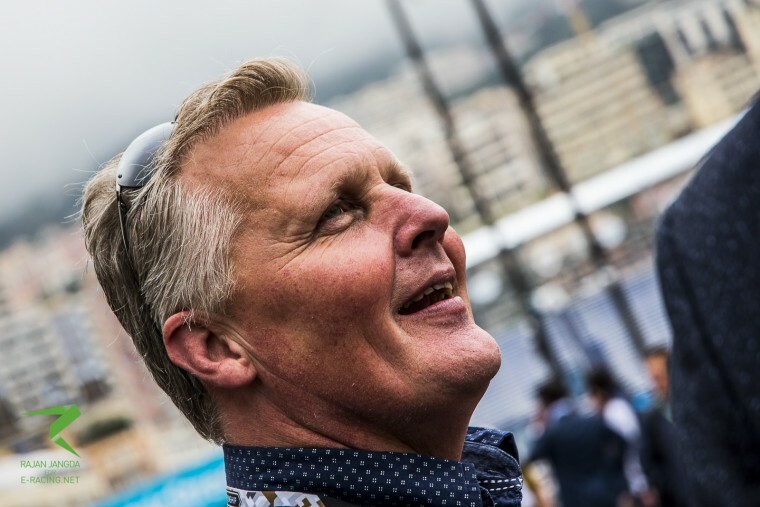 On his first ever visit to a Formula E race at the Monaco ePrix, former Formula One driver Johnny Herbert shared his views with Noor Amylia Hilda on the all-electric championship and how it welcomes drivers looking for a different sort of challenge. Hunting down Johnny Herbert in the pit lane is quite an easy task because there’s always some sort of congregation around him. The former Formula One driver is a very popular figure in motorsports and there’s no question why – he’s a lovely guy to be around and always brings a sense of fun to the paddock. But those who followed Herbert’s racing career would know that the man is a huge source of inspiration and a hero to many. His journey to Formula One was a unique one. He spent over 10 years at the pinnacle of motor racing with teams such as Benetton, Lotus, Sauber, Stewart Racing (scoring them their only GP win at the Nürburgring in 1999) and Jaguar. With three GP wins and seven podiums to his name and not forgetting an illustrious career in sports car racing, most notably winning the Le Mans 24 Hours for Mazda in 1991. He has achieved more than most drivers at his level despite enduring life altering injuries in a F3000 crash at Brand’s Hatch in 1988 just before his Formula One career took off. You’d struggle to find another driver possessed with as much steely determination and self-belief as Johnny Herbert. Recently Herbert was in Monaco to get a bit closer to the action after following Formula E on the telly. “I just wanted to see one live and to see what it was like, because on TV it’s always different and I was impressed,” said Herbert. “The first thing I noticed when I got closer…you can really hear the whine of the transmission and it was noisier than I thought actually. “I was expecting it to be more or less silent and then I watched from the back near the exit of the swimming pool and see them come through and they’re hitting the curb, hitting the ground, and they’re hitting the barriers and the cars are moving around and I like that,” he says animatedly. Herbert, who is also an analyst for Sky F1, took some time off his usual TV schedule to visit the Formula E paddock that weekend as a guest of Faraday Future Dragon Racing. I asked what he thinks of the all-electric championship now that he’s gotten a bit more insight on the series as we chatted in the American team’s garage. “It’s another form of motorsport and it’s technology that we’ll be seeing in road cars. Formula E fits in very well as another single seater series with some great drivers and some have been in Formula One such as [Lucas] di Grassi, [Jerome] d’Ambrosio and [Nick] Heidfeld and I think it’s good that you have those drivers who’ve got the experience and also the drivers that didn’t quite get there, like Sam Bird for example, although Sam’s been doing a good job here as well. However, Herbert acknowledges that Formula One is still at the peak of technology in racing. 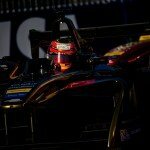 As a driver, what does he make of the Formula E cars? “I’d love to have a go in one just to feel what it’s like, but if you drive a Formula One car, or you drive a Le Mans car or if you drive a Formula E car, or even if you drive a British Touring Car, and if you drive a go-kart, they’re all exactly the same. So, the limit is Formula One, and the limit of a go kart is down there, but to get to the edge, it’s no difference and Formula E is exactly the same. “A Formula One car is very stuck and very grippy, it doesn’t slide, whereas this (Formula E), slides around a lot more and a Le Mans car slides around more and then you get a GT car that moves around a lot more. It’s a different sense when you’re driving but when you adapt to a different style, it’s something which is quite special to do. “With Formula E, it’s a different type of concentration because the car is moving around, so it’s easier to make mistakes. I think that’s a good challenge and it’s something you have to think of it in very a different way such as how you adapt to how a car is feeling. Would he ever have joined the championship if it was around when he was still racing? “It’s a difficult thing, because obviously, my journey when I was in karting was always to get to Formula One and as I’ve said, Formula One is always the top of the tree, so that’s where you’re gonna aim. Although Formula One is still the pinnacle of racing for now and most likely for a very long time to come, it may not be the be all and end all with the existence of championships such as Formula E around now. “The problem that you have in Formula One is that you either get to Formula One or you don’t quite there and then there isn’t really any other choice. Then you have sports cars and Le Mans but that’s a different form of racing but now you have Formula E. So it’s good that you have guys here that have got to Formula One but they’re not quite there anymore, but now they’re able to drive. 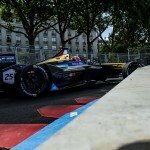 Not surprisingly, the bulk of opinions often heard is the lack of noise of Formula E that presumably makes it less exciting compared to other forms of racing, but according to Herbert, it’s all a matter of different people’s tastes. “You’ll get people that may be a fan of Formula One and they’ll say…’Oh, but its Formula E and it’s electric, it’s not exciting and it’s not very fast,’ and you’ll get people who like Le Mans and they’ll say Formula One is not interesting because there’s not much overtaking. That said, Formula E has been garnering interest amongst the younger crowd, is there probably something other racing series can learn from this to gain more viewership? “I don’t think it’s particularly learning, I think it’s more common sense to have more people interested and you have to allow them to see a driver for example. “You get it here and you get it a little bit in Formula One such as the track parade and the autograph sessions but that’s pretty much all you get in Formula One but it’s about making new ideas and with Liberty Media now, there is a talk of change and it’s not because of Formula E, it’s just because it’s a time for change. “We live in a different world than we did 20 years ago. The younger generation, they have an attention span of one second,” he laughs. “When I was racing we had mobile phones but we didn’t have internet then, we had a fax machine, we had telex, but no internet so it’s completely changed with mobile phones. The mobile phone I had was a Nokia, the one where they’re trying to bring back now,” he says with a chuckle. “Times are changing and you’ve got to move along with the change just like combustion engines – they’re here for a good few more years yet but that’s gonna change and there’s going to be batteries or it’s gonna be hydrogen and combustion.